Mixing some old-fashioned charm with a space-saving form, the Amish Pine Kitchen Corner Hutch with Open Top dresses up a corner like no other. This storage unit is built with Eastern white pine wood and offers three shelves, a charming counter and two raised panel cabinet doors below. 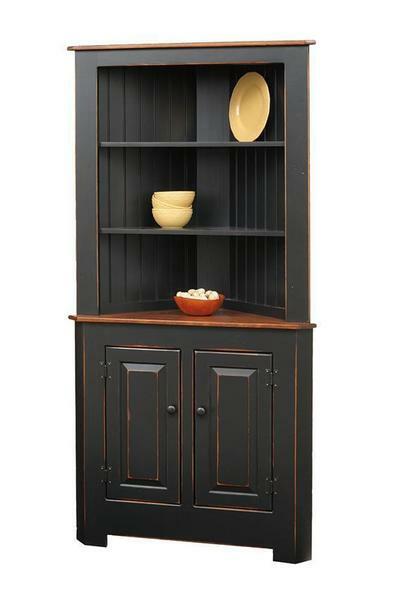 For a dining room or kitchen corner, this beauty has room to store. Solid pine is softer than other hardwoods, but you can still count on it to look stunning and perform well. Pine fits country, cottage and farmhouse styles beautifully. It can be painted bright colors where other woods cannot, as their wood grain would not absorb the paint very well. Pine wood LOVES distressing and it's easy to fall in love with pine that has that antique, loved and worn look. In addition, you just can't beat the price of pine. There's nothing quite like dressing up a lonely corner or fitting in furniture you've dreamed of right where you need it. This pine hutch tucks neatly into a corner space, adding storage to small kitchens or the hallway or entryway. The Pine Kitchen Corner Hutch is available Quick Ship. It has a build time of 3 to 4 weeks. (Please allow additional time for shipping). We offer several solid wood products Quick Ship. If you have any questions or need assistance, please email or call us. Our Furniture Specialists are happy to assist you. Thank you for shopping DutchCrafters for solid wood storage. Height Buffet to First Shelf: 15"
Handcrafted from superior, kiln dried Eastern White Pine Wood which is a sustainable and plentiful wood. Light Distressing with Worm Holes, Eased Edges, Wear Through and other marks to add character. Heavy Distressing is an extensive amount of hand distressing to the furniture. There may be heavy pin holes, indentations and nicks, rasp markings and worm holes. The edges of the furniture are heavily worn. Simulated cracks are created on our heavily distressed package. You can notify your Amish furniture specialists if you prefer not to have the simulated cracks in the furniture. It is an ok piece of furniture. Unable to rate this yet as it is not here. Send this to me again mid December. The quality of the work is excellent. I had been searching for a corner hutch for my kitchen and this is the perfect piece.